09:30 A.M. to 7:00 P.M.
Jakhu Wax Statues Coming Up in Jakhu Ropeway Shimla Madame Tussauds! Jagson International Limited is a Limited Company with the entrepreneur's vision of entering into new fields of Hi-tech and priority sectors and is one of the first private sector companies to enter into the field of off-shore drilling for Oil and Gas exploration. 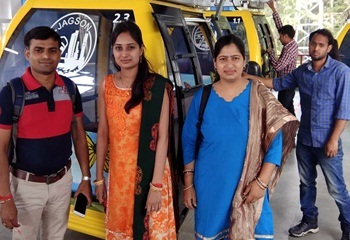 It is one of the safest ropeway in all over india which has 48 safety devices fitted on the ropeway and all the movements of ropeway is monitored by CCTV at control room. Cabin Capacity of 6 passengers in each. The lower station is situated near shiwalik hotel U.S club, Shimla and the top station is situated in the premises of Jakhu Temple. It was brilliant and awesome experience. It was really beautiful. You can see the flowers blooming down on the ground from the gandola. Also the tall trees. Adjacent hills look beautiful. Saw the snow clad mountain on the top. Thrilling experience. Would recommand everyone to try it. It is a scenic view from there and worth a visit.The journey was good worth a visit.It is difficult to describe the feeling when you are at the hill top in Afarwat. You should go there to enjoy it. Then you may decide not to spend time in Switzerland! It was a great ride and the views are dream-like and out of this world. The cable car ride was exciting and takes you up into the mountains.The snow clad slopes were out of the world. Anyways the journey was good......but one should look for the tourist pathway.. The view is good and the whole experience of going there is good. 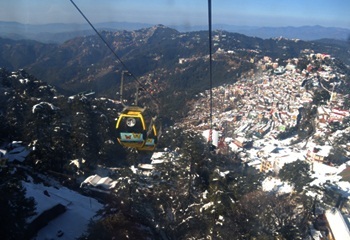 Ropeway Shimla as it is popularly called is just awesome and one of the top attraction in Shimla Himachal.The gondola ride itself is fun and safe, of international standards. Highly recomended if in Shimla. You get to see the majestic view of the lush green hilly terrains. The surroundings are picturesque. It is a great experience and one must not miss if you are in Shimla. 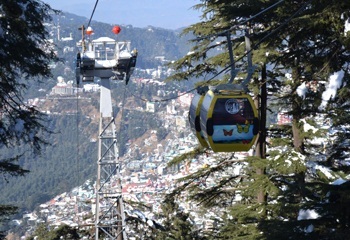 Jakhu Ropeway is the main attraction in Shimla. As there is nothing else to do but Gondola takes you to a point where you can see somewhat beatiful mountains.